Today I completed work on my latest project: the redesign of the Latin Fusion Foods website! I met Chef Scott after he heard me on the Hugh Hewitt Entrepreneur Hour and he decided he wanted to have Fusion Web redesign his site. 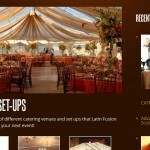 He wanted a site where he could display the beautiful photos of his food and to develop his new company image. The site has some extensive YouTube integration so he can post video blogs and the user doesn’t need to know any html embed coding. 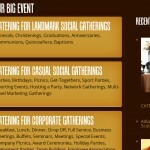 The graphics and site design were a collaboration between Chef Scott and me. 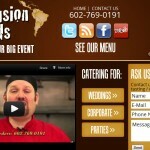 Latin Fusion Foods is a great catering company that specializes in creative burritos and unique blends of food found in Central and South America. Check out Chef Scott’s site, follow him on Facebook and on Twitter @gringochef!